At the beginning of 2004 MPEI (www.mpei.ru) launched a server [1, 2] to make calculations online, scientific, engineering as well as in heat-power engineering field [3–5]. Address of the server home page is www.vpu.ru/mas. 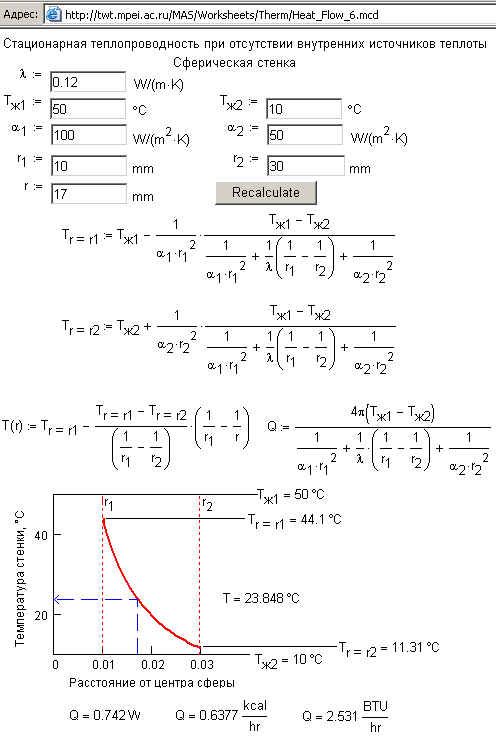 The typical examples of heat engineering calculations shown below present some features of this new information technology in power engineering. Captions contain addresses for direct access to the noted calculations. Figure 1 shows calculation of water and steam thermophysical properties. 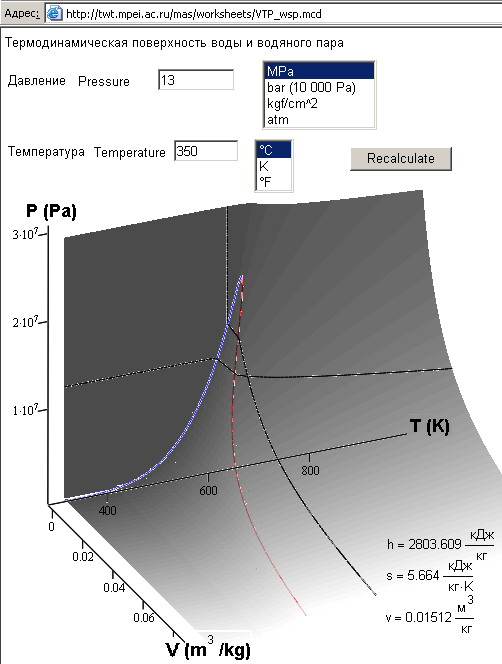 Initial point (pressure and temperature) is represented on the thermodynamic surface. 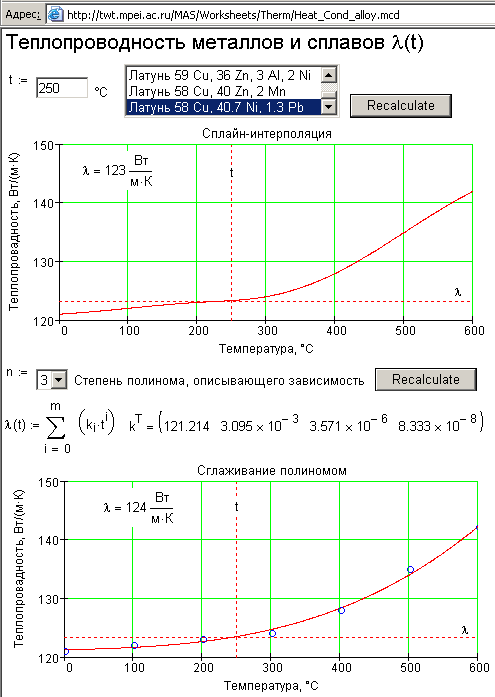 The calculations have been made using WaterSteamPro program package (www.wsp.ru). To integrate such calculation to other program environments (Mathcad, Excel, high level programming languages) one can download it from the Web. But to make a single calculation (reference) of water and steam parameters just visit the site which address is written at the top of Figure 1. All functions of WaterSteamPro package in the mode of online calculations are available at http://www.wsp.ru/en/test. To call required function one should only type its name to the address noted above, for example: http://twt.mpei.ac.ru/MAS/Worksheets/wsp/wspKINVISPT.mcd for cinematic viscosity (KINVIS) depending on pressure (P) and temperature (T). Figure 2 shows Web-calculation of adiabatic (isoentropic) expansion of steam with visualization on h, s diagram. This enables us to see both numerical value (for example, steam humidity at the end of the adiabatic expansion process) and the expansion line itself surrounded with reference points, saturation lines, isotherms, isobars etc. That gives us possibility to see not only “statics” (the value – humidity of steam) but also “dynamics” – to forecast the results for changed inputs. Beside the simple calculations of expansion processes (Fig. 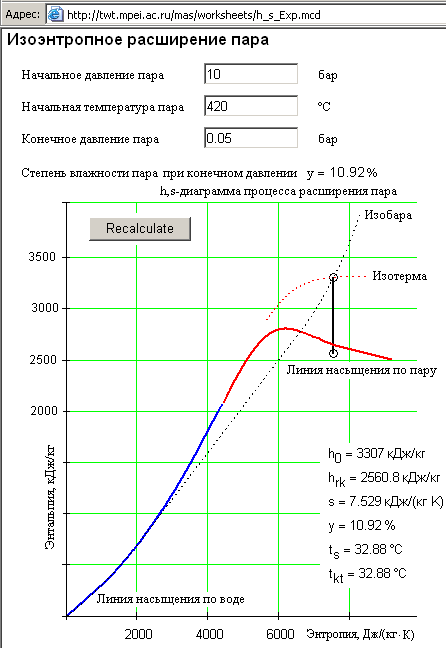 2) the site at www.vpu.ru/mas contains some complicated calculations: steam and other medium expansion in real steam-turbine, gas-turbine, gas and steam power cycles. Figure 3 shows the site for calculation of heat conductivity of some metals depending on temperature. As in previous case, this site shows not only “statics”- the value of heat conductivity of the metal or the alloy for given temperature – but also “dynamics” – the plot of changing the parameter depending on temperature with fixed working point chosen by a user. Two plots are represented: spline interpolation and polynomial smoothing of the points taken from a “paper” reference book . Suggested by the worksheet degree of the polynomial is limited by number of the points and requirements to accuracy of the calculation (in some cases we can apply linear interpolation). Spline coefficients are also represented that allow us to program required dependence in any environments where we may need such calculations: in mathematical packages, table processors, high level languages. Visiting site at www.vpu.ru/mas a user will find reference data similar to those shown in Fig. 3 for some other parameters (heat capacity, viscosity, thermal expansion, strength properties, electrical resistance etc) of the heat carriers and materials used in power engineering (constructive, heat-insulated, and building materials; turbine and transformer oils, fuel oils etc). Different formulas used in power engineering calculations are considered among reference too. 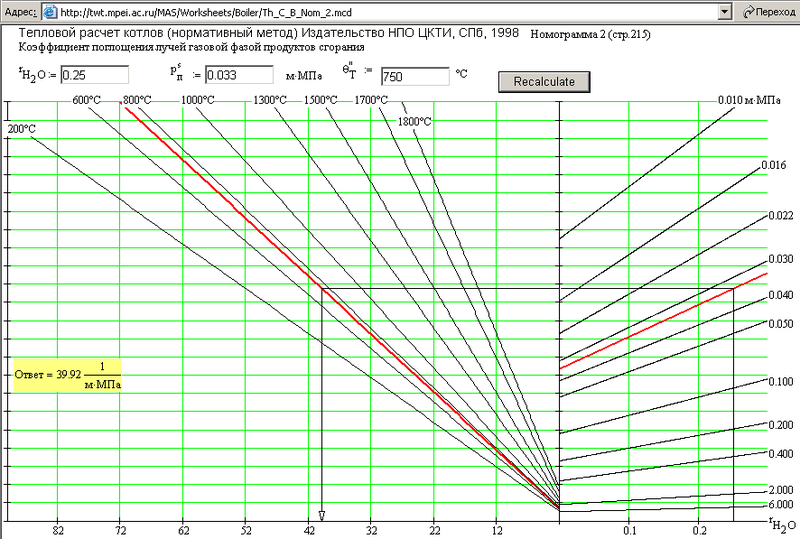 Figure 4 shows such site containing formulas for one case of static heat exchange. The formulas are online: anyone can adjust inputs in the formulas and see the results, and also, as in previous cases, can view “dynamics” of the process on the plot. All calculations at www.vpu.ru/mas are checked for dimensional consistency. Visitors of the site can choose the units of source data (Fig. 1) and see the result with any supported units they wish (Fig. 4). This is a general tendency in scientific and technical calculations connecting with more flexible approach to physical values and rejection of one unit system which has not become and cannot become sole or dominating. Beside plots this site contains nomograms which completely correspond with their “paper” analogues. As an example, Figure 5 shows normative method of thermal design of a steam boiler . As a matter of fact, this nomogram is a function of three variables and it treats some empiric data. A nomogram seems to be superfluous in online calculations but it visualizes the calculation, enables additional check of the source data. Beside, engineers get accustomed to use nomograms and old habits die hard. In addition to reference and normative data the site contains practical calculations connecting both with operation of power engineering units and with possible modernization. Figure 6 shows one page of site collection with typical power characteristics that estimate operating of a turbine . 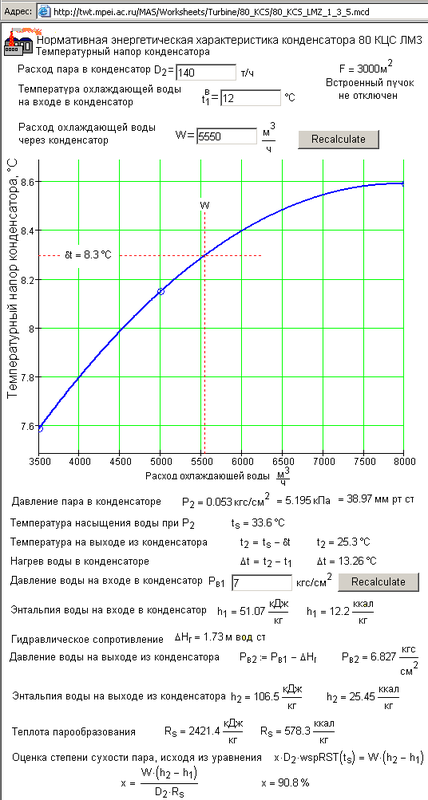 This site contains not only the function of three arguments returning temperature difference of a condenser but also calculation of dryness factor of the steam incoming to the condenser from a turbine. This calculation was made on the base of WaterSteamPro package mentioned above. Figure 7 shows initial and final stage of technical and economic indices calculation for possible reconstruction of water treatment plant in a heat power station. The scheme includes two modern technologies: high-speed counterflow ion exchange filters and membrane units. Planning reconstruction engineers and managing staff of the power station can estimate here investments, operating costs, and other technical and economic indices. The results obtained can be considered as initial point for further detailed calculations. 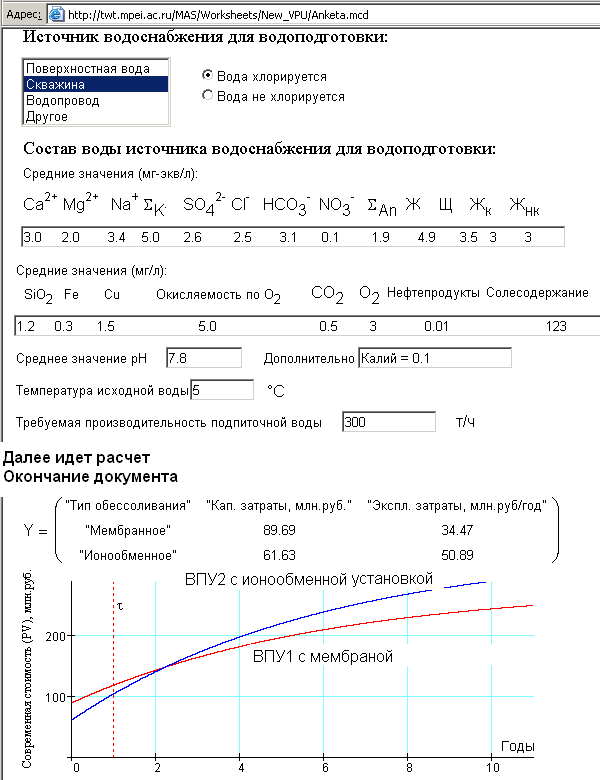 Beside, this site contains references to online calculations of the training aids and courses for students, for example “Water treatment in power engineering”, www.vpu.ru, “Theory of automatic control”, http://twt.mpei.ac.ru/MAS/Worksheets/Rotach/index.html and others. Technology of Web calculations allow us to solve following problems. Engineers of power plants and energy associations have no need to install special program for routine (and not merely) calculations. It is sufficient to have Internet access. Anyone who needs new calculation methods gains access to them instantly. First, transference of the reference information from books into Internet increase sharply efficiency of search and convenience of work. Search can be made via different search systems (for example, www.yandex.com, www.yachoo.com etc). Required site is fixed in Favorites and after that calculation will always be at hand of an engineer or a researcher. Second, transference of the table information from paper into Internet and its treatment can easily uncover mistakes or rather misprints often occurred in the tables. Unfortunately, there are mistakes and misprints in the “paper” tables and formulas. Editors and correctors practically cannot reveal them and they are transferred from one reference book to another. If a misprint from a “paper” table have been transferred into electronic analogue (for example, 3737 instead of 3537), spline interpolation shown in Fig.3 returns simultaneously disturbing wave and force us to find and correct it. The site may contain misprints and mistakes too but being discovered they could be corrected quickly and insensibly for users. Calculation site at www.vpu.ru/mas is a result of collaboration engineering. Calculation documents are created on the base of mathematical program Mathcad well known by scientists, engineers, and students of technical institutions. Worksheets created in Mathcad are converted into Internet with minimum redesign. The group of developers is ready to create online calculations for individual orders of power stations and power associations. It is also possible to deliver calculation files to launch them on computers that have not Internet access. 2. Очков В.Ф. Mathcad 12 для студентов и инженеров. С-Пб. : БХВ-Петербург, 2005 (сайт книги http://twt.mpei.ac.ru/ochkov/Mathcad_12). 3. Очков В.Ф. Математические пакеты: От натурального хозяйства к товарному производству через Интернет. «КомпьютерПресс», 2004, № 5. 4. Очков В.Ф. Решение инженерно-технических задач в среде Mathcad. Справочник «Теплоэнергетика и теплотехника». Кн. 1. М.: Издательство МЭИ, 1999. 5. Очков В.Ф., Утенков В.Ф., Орлов К.А. Теплотехнические расчеты в среде Mathcad. «Теплоэнергетика», 2000, № 2. 6. Анализ изотерм ионного обмена с использованием пакета Mathcad / В.Ф. Очков, А.П. Пильщиков, А.П. Солодов и др. «Теплоэнергетика», 2003, № 7. 7. Тепловой расчет котлов (нормативный метод). СПб. : НПО ЦКТИ, 1998.